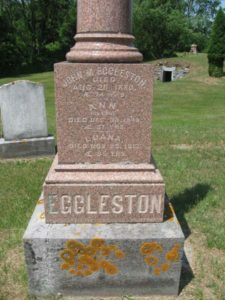 Ron Eggleston made a trip this summer to upstate New York where his branch of the Eggleston family lived, died and many are buried. 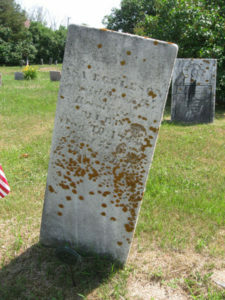 He explored the Kinne Cemetery where he found family headstones. 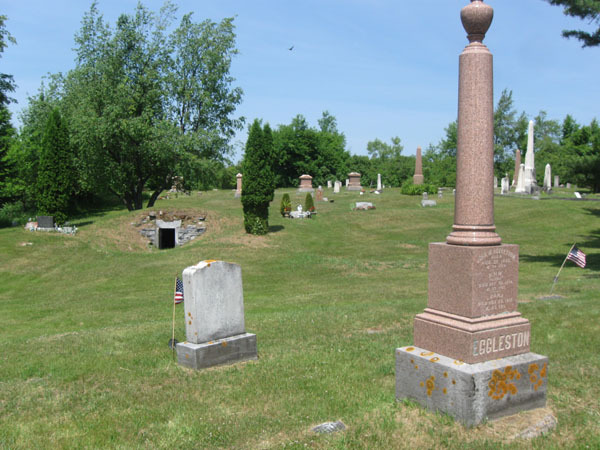 “During the present spring months there has been much mystery and talk about the remains of two people in an open vault in the Dickson Cemetery [this Cemetery was later named Kinne Cemetery] about four miles out of Antwerp on the state highway between Antwerp and Gouverneur villages” says the Watertown Standard. “Scores of people have stopped on the roadside by the Dickson cemetery this year and have viewed the decidedly ghastly spectacle, having been rather doubtful of the tales of the open vault. The vault door is not sealed and all that is necessary is to open the door, walk into the vault and expose the skeletons by raising the coffin lids. But little aside from the skeletons and clothes are visible. Family history, and an informant named Brayton L. Kinne who talked to a reporter, give some background information. 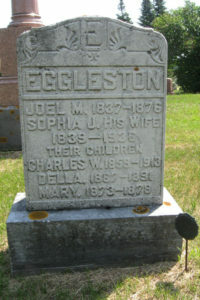 Asa Eggleston Jr. (son of Asa, who was son of Isaac) had several children, including John Mitchell Eggleston who was buried in this cemetery along with his two wives and his son Joel (headstones above), and a daughter Harriet Mary Eggleston. Harriet was born March 2, 1814. She married Richmond Howland Jr., who was born September 10, 1803. He was a a Mayflower descendant, tracing his lineage to John Howland. He was also quite wealthy. Harriet and Richmond Howland lived long lives, but never had any children. 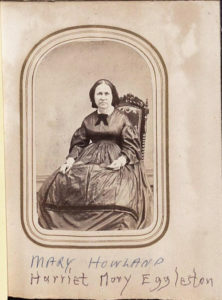 Richmond died before Harriet, who passed away April 25, 1896. According to this article, Harriet and Richmond had an adopted daughter named Alice Gordon. The probate record for Harriet Howland includes a Schedule A which lists all of her living relatives, mostly nieces and nephews. Harriet outlived not only her husband, but also all of her siblings. Alice Gordon is not included in this list, and no where does it indicate that she was a daughter, adopted or otherwise. Alice Gordon and Harry Green were appointed executors of Harriet’s will, and she was to be given $500 in the original will, which was dated July 13, 1893. A codicil No. 1, dated November 20, 1895, indicated that Alice was to be given furniture and household goods. Harry Green was also given specific items, including furniture he had made. Alice was directed to distribute any household articles not specifically mentioned. A second codicil dated April 11, 1896 gave Alice Gordon Harriet’s house and land in Antwerp. It appears that in the few years between the writing of the original will and the second codicil, which was actually made days before Harriet’s death, this Alice Gordon must have become much more dear to Harriet – or gained more influence over a wealthy and feeble elderly woman on her deathbed. Alice Gordon did sell land in Antwerp, including an almost 4 acre parcel in the village March 23, 1900. She sold additional land in 1903. One is left to question whether Miss Gordon’s aspirations for wealth were greater than her affection and loyalty to Harriet Howland, or even her sense of decency. This entry was posted in Cemetery Tour, Contributions by others and tagged Cemetery, Eggleston, Howland, New York. Bookmark the permalink. Interesting. So, we don’t know who’s bodies are buried in the vault? But more than likely, it’s friends or associates of some the Eggleston family, if not some of the family. Is this correct? And probably buried there in the vault around 1856? More searching could be done to see if we don’t know the burial places of some of our New York ancestors. Not meaning to be disrespectful to our ancestors, our grandchildren, as descendants of the Eggleston Family will be very interested in this story as this is the month of Halloween! It would have been Richmond Howland and his wife Harriet Eggleston Howland who were buried in the vault. Harriet died in 1896, but Richmond died before she did. They apparently purchased the vault before their deaths and there is no record of them being buried elsewhere. Thank you Karen. My husband is a descendant of Veda Eggleston Jones and we have enjoyed your work and writings very much. Thanks again Karen for sharing all that you have found! This story is one to remember especially at Halloween! !